Traditional Chinese medicine (TCM) is now frequently used to support and enhance fertility to achieve pregnancy. Acupuncture has been shown to regulate hormones and affect the Hypothalamus-Pituitary-Ovarian Axis, which controls ovulation, thickens the endometrial lining and increases blood flow to the uterus. 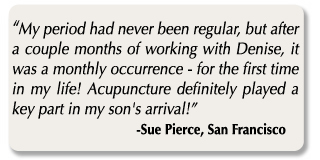 In men, acupuncture can improve sperm volume and motility. For both men and women, treatments will boost the immune system, increase energy and libido, and improve relaxation – all of which positively affect the likelihood of conception. TCM is also used to enhance the efficacy of Assisted Reproductive Technologies (ART), such as Intrauterine Insemination (IUI) and Invitro Fertilization (IVF).